Sometimes all it takes is a little paint and creativity to turn a boring old item into a refreshingly new-looking piece of decor. Our TV stand is the same cheap one I bought for my first apartment after college. I loved it for a long time, but have really wanted to throw it out and buy something new lately. There is nothing wrong with our tv stand, but I was feeling like it just wasn’t me anymore. The dark wood coupled with the large black TV felt like a black hole. But instead of running out and buying something new, I decided to make do with what I had and find a way to make it more functional and beautiful. And now it has such a different vibe that it doesn’t even feel like the same piece! I know it may seem taboo to paint a perfectly good piece of furniture, but do whatever makes you love your home! You may want to think twice about painting a family heirloom, but cheap furniture is always fair game if you ask me. Two quick coats of chalk paint and 20 minutes of organizing later, and I have fallen back in love with our painted TV stand. This post contains affiliate links for your convenience. For more information, see my disclosures. Set up your workspace by covering the floor with a drop cloth and gathering your supplies. Then carry in your TV stand and you’re ready to get to work. I used my new painter’s pyramids to raise my furniture piece off the floor slightly, which makes it easier to paint the legs. They worked great and are an awesome (and cheap!) addition to my painting arsenal. I set up my workspace by laying a drop cloth on the floor and setting the TV stand on top of a few painter’s pyramids. These little guys are new to my painting arsenal and are super handy! They raise your furniture off the floor slightly so you can easily paint the legs. 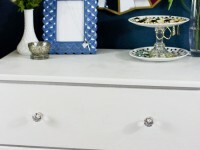 Before painting furniture, clean it thoroughly. Use a degreaser and lint-free rag to wipe down the entire piece. This gets rid of dirt and grime and preps the surface for chalk paint. If your TV stand needs any small repairs or has dents to fill in, do this now before you begin painting. Step 2 | Paint Away! 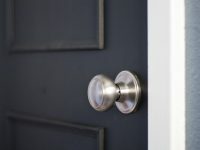 With chalk paint, there is no need to prime OR sand because the paint will adhere directly to the existing surface. Use a paint brush to get in all the corners and a mini foam roller to cover the flat surfaces. I used a 2” angled brush and a 4” mini roller for this project, and the painting went very fast. 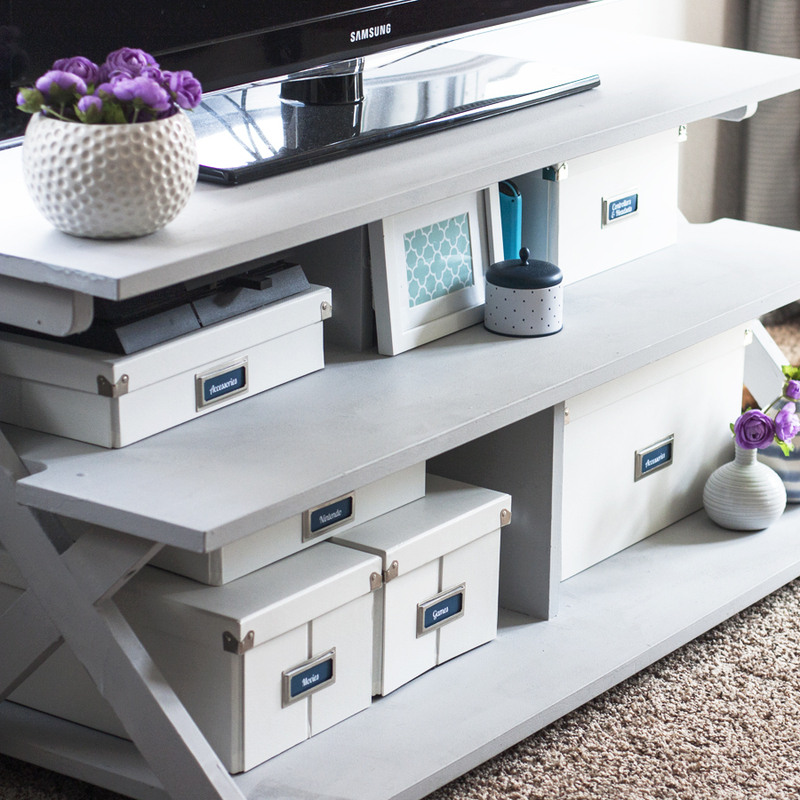 It took two coats and some touch-ups to complete the TV stand makeover. Two things I LOVE about chalk paint is that it dries quickly and doesn’t fill your house with that strong paint smell. The final step to a painted TV stand is to seal the paint to protect it from scratches and damage. Clear furniture wax is the most common way to seal chalk paint, but you can also use a polyacrylic or other clear topcoat. 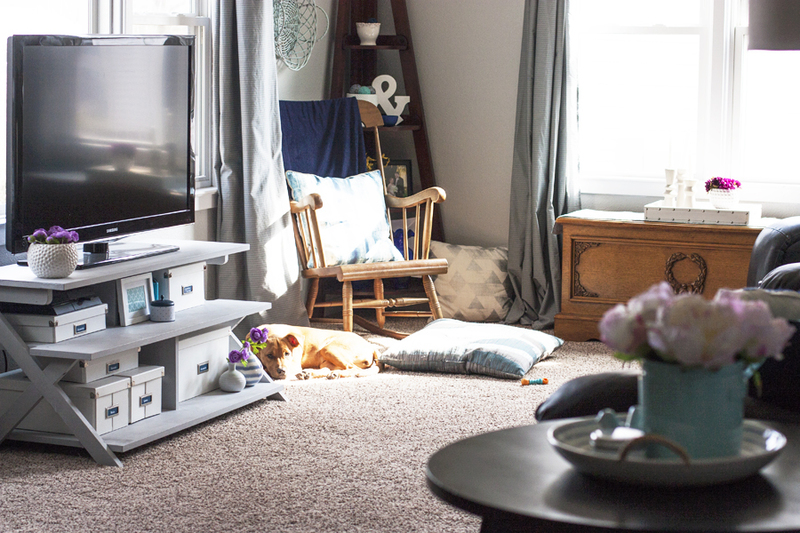 This painted TV stand project drastically changed the look of this side of our living room! My goal for this year is the refine the decor in our living room and lighten up the entire space, and this was definitely a step in the right direction. It looks so pretty now, and hard to believe this is still the same budget TV stand I bought for my first apartment years ago. 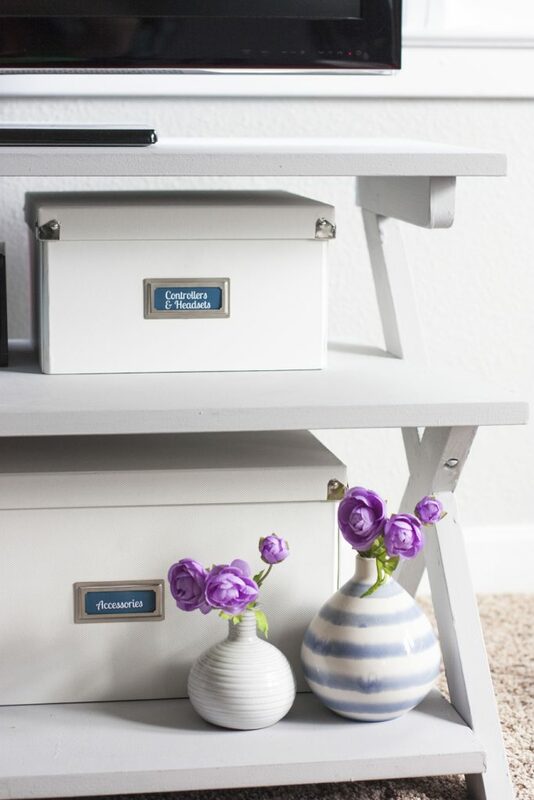 I used pretty storage boxes to add more function to our TV stand, and they keep everything neat and organized. 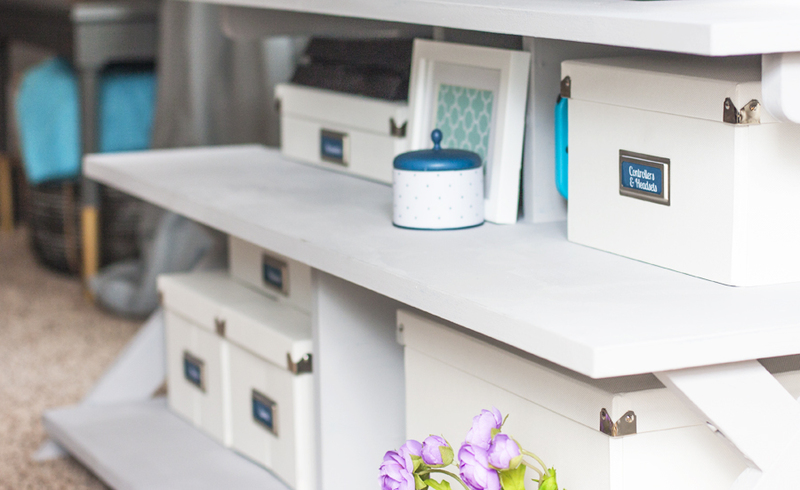 I shared all about how I organized our newly painted TV stand in this post. The storage boxes are functional and pretty, so I didn’t add a ton of frivolous decor. 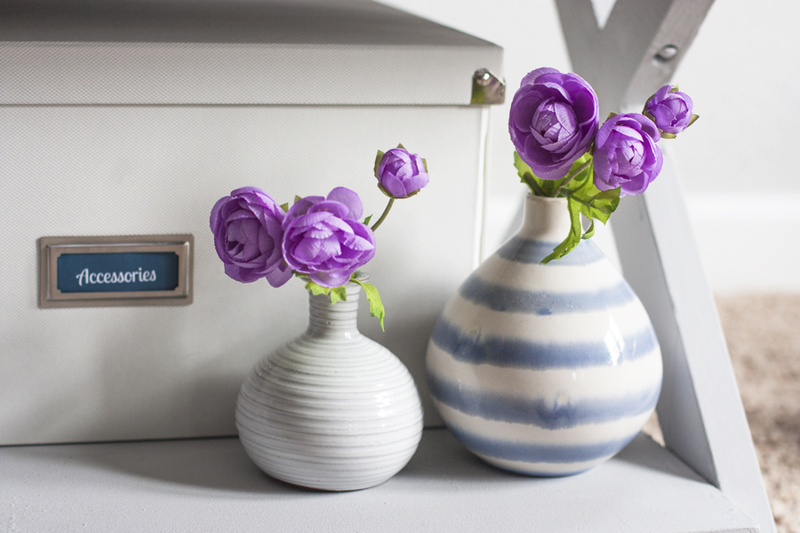 I couldn’t resist adding a few pretty vases, though! 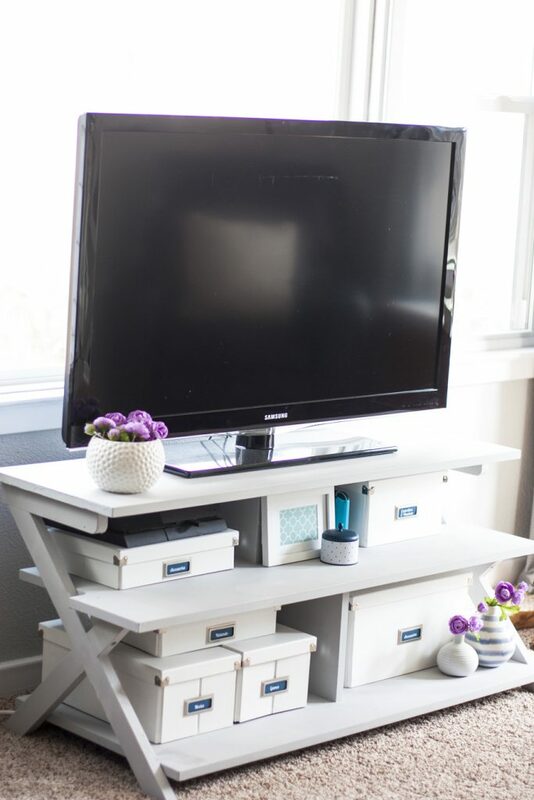 If you’ve been thinking about painting your old TV stand, I highly encourage it! 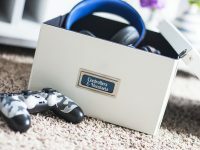 « Casual Friday | Fav YouTuber, A Time-Saving Email Tip, Navy Shiplap, Etc.